But Assad is secular and allows alcohol! Via Human Rights Watch, use the slider in the middle to see satellite photo before and after of the Assad regime targeted destruction of high-rise apartments in Damascus suburbs. Enjoy Sochi everyone! Goldman Sachs Group Inc. (GS) made about $350 million on “worthless” derivatives trades after exerting “undue influence” on managers of the Libyan Investment Authority, according to the sovereign-wealth fund, the second-largest in Africa. LIA sued Goldman Sachs on Jan. 21 in London over investments of about $1 billion made in 2008. The fund said in court documents released today that its executives, who were given gifts of chocolate and after-shave by the bank, never understood the transactions. Denmark's Socialist People's Party announced on Thursday it will leave the government but will continue to support the centre-left ruling coalition led by Prime Minister Helle Thorning-Schmidt. The Socialist party, which has been at odds with its coalition partners over economic policy, quit after an internal split over a government plan to sell a stake in state-owned utility DONG Energy to a group of investors led by Goldman Sachs . An 18-year-old woman, who was one of seven people injured in a crush outside Copper Face Jacks nightclub in Dublin last night, is now in a stable condition in hospital ... The incident happened outside the club on Harcourt Street at about midnight. Gardaí say around 1,500 people were queuing outside the nightclub at the time. The club was running a night called 'Messy Mondays', in which all drinks are €3.50, according to its Facebook page. Ireland has a vigorous alcohol lobby which works within a major public blind spot about drinking to make it seem normal that 1500 people -- by all accounts, mostly teenagers -- would queue up at midnight on a Monday night for somewhat cheap booze. Politicians on both sides of the aisle can speechify and expound arguments about how we are winning and losing simultaneously, and how, either way, we should leave now. They may persuade themselves and the American people. But they will be just as wrong as George H.W. Bush and Bill Clinton were to ignore Afghanistan in the 1990s, to our great pain and suffering. Wasn't some other guy President in the 8 months leading up to 9/11? For unkown reasons, the mandate went out 2 days ago to the People Like Us blogs: of all the international news stories that might be covered, protest photos from Kiev were the one thing that should make the cut. See e.g Gawker, Crooked Timber, Nick Kristof, and Josh Marshall. On the other hand, if you're in, e.g. Aleppo and under constant air attack from Bashar al-Assad while his foreign minister bleats in Montreux about being the real victim, you don't count. Above, Aleppo residents use a baby's cot to retrieve possessions from an apartment building hit by an Al-Assad airstrike. Way to make the parts of Ukraine that used to be in Poland feel better about being in Ukraine! Erik Prince —ex-Navy SEAL, ex-CIA spy, ex-CEO of private-security firm Blackwater —calls himself an "accidental tourist" whose modest business boomed after 9/11, expanded into Iraq and Afghanistan, and then was "blowtorched by politics." To critics and conspiracy theorists, he is a mercenary war-profiteer. To admirers, he's a patriot who has repeatedly answered America's call with bravery and creativity. Now, sitting in a boardroom above Hong Kong's Victoria Harbour, he explains his newest title, acquired this month: chairman of Frontier Services Group, an Africa-focused security and logistics company with intimate ties to China's largest state-owned conglomerate, Citic Group. Beijing has titanic ambitions to tap Africa's resources—including $1 trillion in planned spending on roads, railways and airports by 2025—and Mr. Prince wants in. Erik Prince now lives in Abu Dhabi. The former Navy SEAL and creator of the military-contracting company Blackwater isn’t even sure he wants to remain an American citizen. “Uh . . . for the record, for now I plan on retaining my U.S. citizenship, but I am very, very worried about the direction of America right now,” he told me on November 18, the day before Civilian Warriors, his book about his time at the helm of Blackwater, was released. Blackwater was an amazing success story. A company born out of a desire to help America in any way possible, it provided security for diplomats, resupply aid to soldiers, relief to disaster-struck populations, and more. Yet it was ruined by the politics and policies of the government it served. Looking back on the story of Blackwater, Prince worries about the future of the country he had risked his life for and built his company to aid and protect. For the current WSJ piece, it's as if the Abu Dhabi stint -- which lasted for years -- never happened. And for National Review, looking for an irredentist attack line on Iraq war critics, there isn't a hint that a new venture based on helping Chinese Communist oligarchs extract natural resources from Africa was imminent. Can't mess with the narrative. During the telephone call, President Barroso made notably the following points: President Barroso deplored in the strongest possible terms the escalation of violence, and reports of violence against journalists, and expressed great concerns about the reports on missing persons. The use of force is not the answer to the political situation in Ukraine. He urged President Yanukovych to start immediately a dialogue at the highest level with the opposition. This is the President's role as Ukraine's Head of State. President Barroso welcomed the interim agreement reached in November 2013 on the Joint Plan of Action and the start of its implementation on 20 January. Iran should use this window of opportunity with determination to move to a comprehensive long-term solution on the nuclear issue. This would open up the potential for an improved relationship and broader cooperation. Does Iran not have its own episode of escalating violence against protestors and lack of dialogue with the opposition, not to mention its support for Bashar al-Assad's extreme measures in that regard? Yes. But not in the way that recently makes the headlines or elite cocktail chatter at Davos. One wonders how much business and economics journalism is coloured by the prospect that one day, the scribe could inside the speculative finance matrix? Also too, Andrew Balls is the brother of Shadow Chancellor Ed Balls. Potential for some awkward family get-together conversations in the future. Airlines, labor unions and some lawmakers have called on the U.S. to block Norwegian Air Shuttle's expansion as they say the airline's business model, which involves the registration of its aircraft in Ireland and hiring of staff at local bases in Europe, Asia and the U.S., is an attempt to circumvent Norwegian labor laws and set a precedent for airlines to use shipping-style "flags of convenience" to cut costs ...The airline, which operates long-haul flights from Oslo, Stockholm and Copenhagen to New York, Bangkok and Fort Lauderdale, Fla., wants to add flights to Los Angeles, Oakland, Calif., and Orlando, Fla., from Scandinavia as well as from a trans-Atlantic base at London Gatwick airport. To oversee the planned expansion, Norwegian has set up an Irish subsidiary called Norwegian Air International, which needs both an Irish operator license and a U.S. foreign-carrier permit to realize its plans. Both licenses are still pending as the airline's plans are met with resistance in the U.S.
Now in fairness, the high prices and abysmal service on existing transatlantic routes, especially to smaller markets -- like Dublin! -- surely warrant a new entrant that could at least pair the abysmal service with low prices. But it does seem a tad bold for Ireland to be in this particular form of arbitrage with the bailout barely done. And anyway, the airline isn't proposing to fly from Dublin. Sweden learned its lesson about runaway government a generation ago, after the country's full-service welfare system and tight capital controls wrecked the economy. After repeatedly devaluing the krona and prompting a run on the currency, the central bank briefly imposed 500% interest rates. Sweden's case, in particular, offers some striking parallels to the U.S. situation. After the deregulation of credit markets in 1985, lending boomed, particularly in real estate. Low interest rates, lax supervision and inexperienced lenders led to a surfeit of questionable loans. Asset prices soared, with Swedish real-estate values and stock prices more than doubling in the latter half of the decade. Amid rising inflation and a sharply appreciating currency, the boom turned into a bust in the early 1990s. Property prices plunged. Unemployment soared to 12% in 1993 from 3% in 1990. After nearly a decade of expansion, Sweden's economy shrank in 1991 and 1992. A tidal wave of bankruptcies -- and a rapid drying up of finance for the bank-owned niche operations that had fueled much of the lending -- pushed total loan losses on Sweden's biggest banks to some 12% of the country's gross domestic product and prompted five of the seven biggest banks to seek capital injections. So it was runaway government, if by "government," you mean "banks." But of course with a banking crisis again the rationale for restructuring the state, maybe they are the government! European intelligence agencies secretly met with Syrian President Bashar al-Assad's delegates to share information on European extremists operating in Syria, the first known encounters since withdrawing their ambassadors. Bashar al-Assad is running the 1980s Saddam Hussein playbook to perfection. UPDATE: The story now has wide circulation e.g. BBC. Latvia joins the euro area as a catching-up economy. There is a potential for further price level convergence in the long term, as income levels rise towards the euro-area average. While this does not automatically imply a loss of price and cost competitiveness, the process needs to be managed carefully in order to pre-empt excessive price pressures at an early stage. This in turn requires productivity growth, continuous improvements in business environment and new investment. Looking ahead, it is essential that sustainable convergence is not jeopardised by another round of re-emerging imbalances assuming that real interest rates may remain for a while lower in Latvia than in the euro area on average. The issue is that technocrats can use all the formulations they want about the wonders of structural reform, but Latvia is bound to have lower real interest rates than other Eurozone countries because the interest rate is set in Frankfurt but local prices have to rise as it gets richer. See under: Ireland, Portugal, Spain, Greece. Is the Commission at least tacitly admitting that the Euro was flawed for these countries? Maybe the Eurocrats used their time in Riga to buy property. Latvia's membership shows that the euro remains attractive and open to those that meet the required conditions. And, by the way, we are, as you know, already working with another Baltic country, Lithuania, so I think that not very far from now we will have all the three Baltic States as members of the euro. And I don't need to signal how important this is, not only from an economic, financial and monetary point of view, but also from a political point of view. I'm saying this because in a year when voters go to the polls in the European Parliament elections, we must remind our citizens of the benefits of a united Europe – and also of the dangers of disunity. One hundred years ago this year, Europe began a terrible war that tore our continent apart. Twenty-five years ago, the wall dividing our continent was brought down. Ten years ago, we welcomed Latvia and nine other member states into the European Union. And today we are welcoming Latvia as a member of the euro area. That's a not very subtle dogwhistle, putting the spectre of the USSR and two world wars as the bread on a European Parliament election sandwich. And who could he possibly have in mind when talking about how voters will need to be "reminded" of the dangers of disunity? But seriously, could the likes of Marine Le Pen and Nigel Farage have better support than the besuited EU aristocracy running around hinting that they are paving the way for Hitler and Stalin? The Benghazi obsession is getting stranger. Here's Thomas Joscelyn with a long post for the Weekly Standard which is all about various Tunisian characters with connections to Al Qaeda and the Benghazi US Consulate attack and it's presented as vindication that there is some nefarious cover-up about what really happened at Benghazi. Yet the original focus of the right-wing critique of the New York Times end-of-year in-depth accounting of what happened at Benghazi was an Egyptian named Mohammed Jamal. Neither he or the alleged Egyptian connection is mentioned anywhere by Joscelyn. Another week, another bad guy. Today, according to multiple reports, Ben Hassine is likely in hiding in Libya. According to other unconfirmed press reports, Ben Hassine met with leaders of Ansar al Sharia Libya, AQIM, and Jabhat al Nusrah (an al Qaeda branch based in Syria), in September 2013. They allegedly met to discuss the pipeline of North Africa recruits being sent to Syria. While the details of this putative meeting have not been verified, there is strong reporting on the role the Ansar al Sharia in both Libya and Tunisia play in sending recruits off to Jabhat al Nusrah – that is, al Qaeda – in Syria. In any event, the Ansar al Sharia organizations’ role in the jihadist pipeline to Syria is an important point of operational similarity. This powerful rebel group is comprised of both Syrians and foreign militants and has been formally recognized by the central leadership of al Qaeda as its franchise in Syria. So Al-Nusra Front is not "an Al Qaeda branch based on Syria." It's the Al Qaeda branch based in Syria. But for whole Benghazi narrative to hold water, the Weekly Standard needs it to be the case that a country can have all sorts of groups that can be labelled Al Qaeda. RTE -- A 41-year old niece of fashion icon, Ralph Lauren is to be sentenced tomorrow in relation to an air rage incident that occurred on Monday. Jenny Lauren appeared at a district court sitting held in a licensed premises today for her case after spending a night in the cells at Shannon Garda Station. Solicitor for Ms Lauren, Sharon Curley confirmed to Killaloe District Court that Ms Lauren would be pleading guilty to the three charges brought against her in relation to the incident on board the Barcelona-JFK flight. 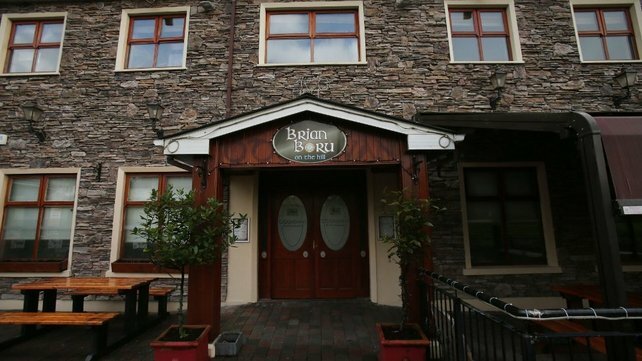 At Killaloe District Court – held today (tues) in Brian Boru pub in the adjoining Lough Derg town of Ballina – Judge Patrick Durcan said that it would not be appropriate for the case to be dealt with at Killaloe and said that the case should be heard in Ennis on Wednesday. Both [US and Iraq] confirmed the strong U.S.-Iraq security partnership under the Strategic Framework Agreement, and the need for greater cooperation among Iraq’s neighboring countries to combat the regional terrorist threat. Which neighbors, exactly, will be cooperating to combat this regional terrorist threat, bearing in mind that the regional terrorist groups are joint Iraqi-Syrian? Air Force One was barely off the ground for the 10-hour flight when White House aides began making bold predictions: They expected no urgent news to break during the trip. And this year — for the first time since Mr. Obama took office and began making a regular Christmas sojourn to Hawaii, where he lived as a teenager — they were right. BEIRUT, Lebanon — The images of recent days have an eerie familiarity, as if the horrors of the past decade were being played back: masked gunmen recapturing the Iraqi cities of Falluja and Ramadi, where so many American soldiers died fighting them. Car bombs exploding amid the elegance of downtown Beirut. The charnel house of Syria’s worsening civil war.But for all its echoes, the bloodshed that has engulfed Iraq, Lebanon and Syria in the past two weeks exposes something new and destabilizing: the emergence of a post-American Middle East in which no broker has the power, or the will, to contain the region’s sectarian hatreds. Last year, The Weather Channel decided to start naming winter storms that hit the USA. For reasons elaborate upon here, this is scientifically idiotic as winter storms don't have any of the clear criteria of tropical storms/hurricanes, and the usefulness of named storms derives from their application by official meteorological services, which a TV channel is not. So it's purely a ratings gimmick that free rides off the official practice. Added points for copycat idiocy here since Christine is an actual named tropical cyclone that was in the southern hemisphere last week. It's the Atlantic Ocean. There will be low pressure systems. They will cause winds, sometimes high winds. And then, as the shipping forecast says, they will lose their identity. But that identity comes from its structure, not from what the Brick Tamlands of the world call them. Much of the criticism of the recent New York Times in-depth investigation of what happened in Benghazi on September 11, 2012, is predicated on the idea that there's a straight line between a local Islamist-branded militia and "Al Qaeda." The current situation in Iraq and Syria tests that to the limit. There is a group called the Islamic State of Iraq and al-Sham (ISIS, or Arabic acronym Daesh) which simultaneously is in increasing control of large parts of Al-Anbar province of Iraq in opposition to the Baghdad government, while its Syrian operation is being accused -- with some supporting evidence -- of having links to Bashar al-Assad's government despite its supposed opposition to it. As has been pointed out, since the Al-Assads were acting as a conduit for foreign jihadis coming to Iraq to fight the Americans in the mid-2000s, it's not beyond the bounds of possibility that the regime kept some links to them. If it all seems chaotic as an Assad strategy, it's worth remembering that Après moi le déluge is nothing new. As a result though, even people in an "Al Qaeda" affiliate might not be sure who's pulling the strings.